Unusual food combinations. Now the above would really be quite something. I haven't tried it all together. The reason I mention them together is because I thought it would be a good idea to seperate my recipes to a different blog. I called it Kaas and Kimchi, because I want to write a cookbook with that name, because that would sum up my background. I was born and raised Korean, so that explains the kimchi. I grew up in the Netherlands so that would be cheese, which in Dutch is kaas. I still want to write that book and writing them in blog form is helping me to create the that book. However the idea to do it in a seperate blog was getting too much. So I'm back here with my recipes. This time it's doughnuts. Ah, now the title is fully explained. 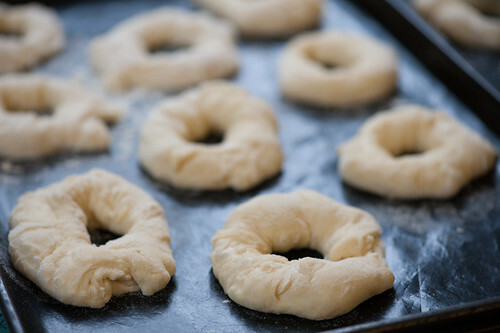 I've had doughnuts on my list of wanting to make recipes for quite a while. I don't buy them often for obvious reasons, but my kids love them. I too remember doughnuts fondly. I remember that my mum would buy them whenever we had been to Amstelveen for shopping. We used to live in a small village close to it. How I wish I could have a look at that packaging again. It was somewhat pink/orangy and those doughnuts were such a treat. Anyway lately I seemed to have been bumping into other people making doughnuts or enjoying doughnuts. So I thought it was time for me to make my own. The reason is that I've started to finish anything I have in my freezer or stock cupboard. As I had friends coming over for dinner I thought making some springrolls would be good. This also meant I could deep fry the unfried prawn cracker I so abundantly have in stock and it meant I could have a go at my doughnuts. I don't like using my deep fry oil more than once, at the absolute most twice, so when I do deep fry I try to make the most of it. As always I wish I had taken a bit more time to make lush photos like that of my doughnuts experiment. But when I have friends coming over, I'm always so hurried I don't have time to shoot leisurely. Another time for the doughnuts for sure, as my kids went wildly mad for them (as did our friends). Nonetheless I managed a picture before and after the frying. Put dry ingredients together and mix. In another bowl put egg, milk meldted butter and vanilla. Stir into flour mixture, mixing until well combined. Let the dough rest for 5 minutes, then knead for 6-8 minutes by hand or mixer until you have a smooth soft dough. Place the dough in a buttered bowl, turn it over to grease the top and let it rise, covered in a warm place for 1,5-2 hours, until doubled in size. Flour your hands and deflate the dough. Take a piece of dough, approximately the size of a golfball. Pierce a hole in the middle and softly widen the center, trying to keep the dough the same thickness al around. Don't worry too much if it is not exactly the same size. Place it on a floured baking tin or use a non stick baking sheet. Personally I use this one. Continue till you've used all the dough. I made 18 and this meant I could fit 9 on one baking sheet. Cover with a clean cloth, let it rise for another hour until doubled again. Prepare the glaze by mixing the milk with the icing sugar. Heat oil in deep fryer till 190C. I like timing my doughnuts into different stages. It turned out it took me 45seconds on one side before I had to turn it over to the other side. Also my deep fryer fitted 3 doughnuts. So what I do is to start by putting in just one. After 15sec put in the next and another 15sec put in the third, wait another 15sec turn over the first. With another 15 seconds turn over 2nd, another 15sec turn over third. 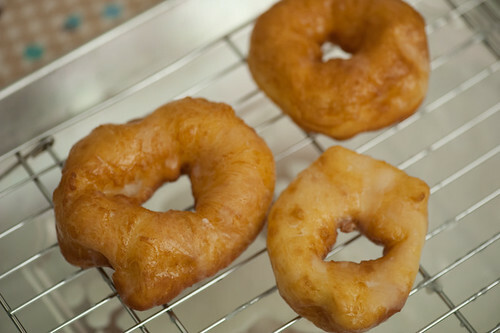 Another 15 sec, while you take out the first, put in another doughnut, Hold the first doughnut a bit above the fryer to let the oil drip after that it goes straight into the glaze. Turn it over, so it gest coverd completely and then take it out of the glaze and let it drip on a rack. In same manner continue with the rest. So this way each doughnut gets the correct time in the batter, instead of having to take out 3 at the same time. if you only lived closer !! Oh my, this is so interesting! I didn't know you wanted to write a cooking book, that would be a fabulous idea! And the recipe, looks so very intriguing! Thank you for sharing!